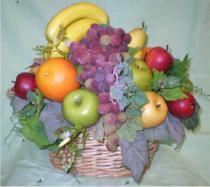 Charming Petals offers a wide variety of fruit baskets. 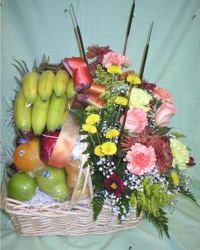 You can decide whether you want your fruit basket to include fresh flowers. All baskets are made to order and each basket is individually created for you. Items subject to availability. We also offer a variety of gourmet gift baskets. Gift baskets with gourmet cheese and crackers or snacks filled to the top are available. Call today and ask for your favorite gourmet foods. 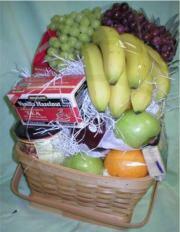 Fruit baskets start at $50 and up. Fruit & flower baskets start at $75 and up. Delivery is available to many local areas. Stop by to see our wide selection of flowers and custom picture framing options!